I was provided with complimentary sunglasses in exchange for my honest review. This post may contain affiliate links. Did you know this? Because I sure didn’t; not until I sat down to write this post. I’m pretty cautious when it comes to my girls and the sun – I do my best to make sure they always wear sunscreen & hats, and that they stay covered up and in the shade as much as possible. And my husband & I rarely leave the house without sunglasses. But sunglasses for my kids? Not so much. They have sunglasses. Pretty nice ones, in fact. But once the novelty of having them wore off, the kids stopped wearing them…and I never pushed the issue. And now those nice sunglasses are somewhere in the abyss of broken & forgotten toys. You have one of those too, right? Luckily, we get to try this again. The amazing folks from Under Armour sent me sunglasses from their new 2014 line for my whole family to try out! We had lots of choices – each of us got to pick a style, frame color, and lens color. 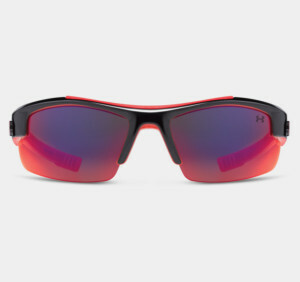 First, and most importantly, all Under Armour® Performance Eyewear lenses block 100% of UVA, UVB & UVC rays – so since any pair that we picked would offer the maximum protection, it was just a matter of personal style. 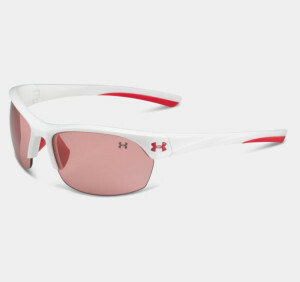 She picked the Kids’ UA Nitro L with red frames and black lenses. 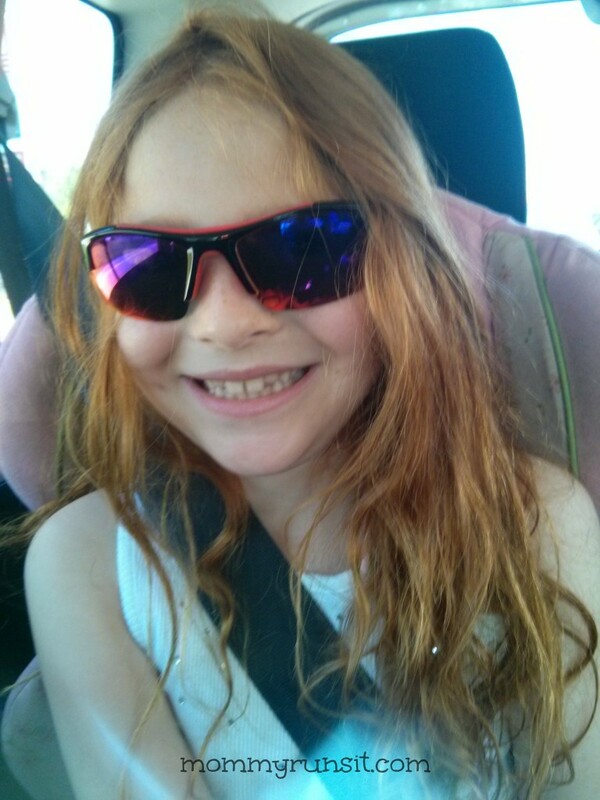 I wanted something a little sturdier for my 5 year old, so we picked the Kids’ UA Ace Sunglasses. 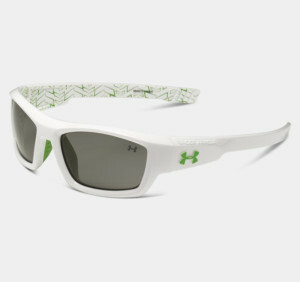 They don’t come in pink (her favorite), so we agreed on the white frames with green accents. Mine was an easy choice – the Women’s UA Marbella, which are made specifically for the female athlete. I chose satin white frames with crimson lenses. For my husband, we chose something a little different. 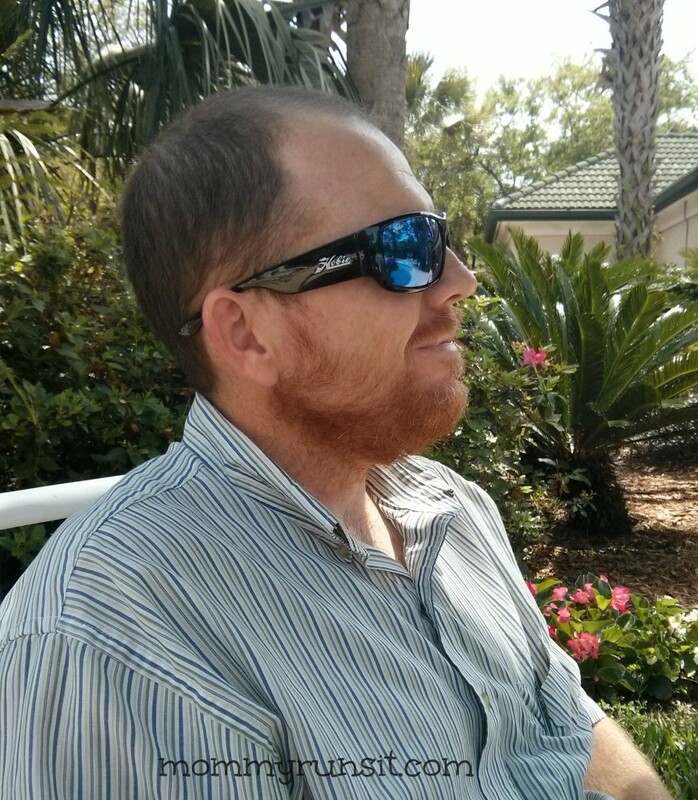 His job often requires him to work from a boat, so he decided that polarized lenses would work best for him. Polarized lenses are a little different from regular sunglasses because they filter out glare. 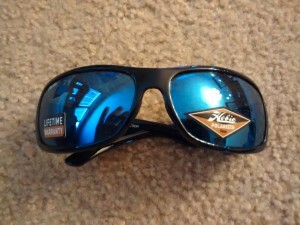 He chose the Hobie Polarized Bayside with cobalt mirrored lenses. The kids like their new sunglasses a lot. The glasses are lightweight and fit well, and they seem to be comfortable (i.e., no whining or fussing). I like the superior eye protection that the Under Armour sunglasses give my girls. However, you get what you pay for, and these sunglasses are a little pricey. The kids’ collection retails from about $50-$65, depending on style, frames, and lenses, and that’s just a bit too high to fit my family’s budget. 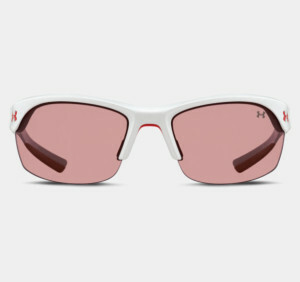 If my girls were older and/or played outdoor sports, I could see making the investment because these are great sunglasses. But at 5 and 8, my girls are way too likely to toss them in the mud and step on them during a game of tag. So I’d recommend these for maybe ages 10 and up – or whatever age kids are when they stop breaking or losing their things within 24 hours of purchase. 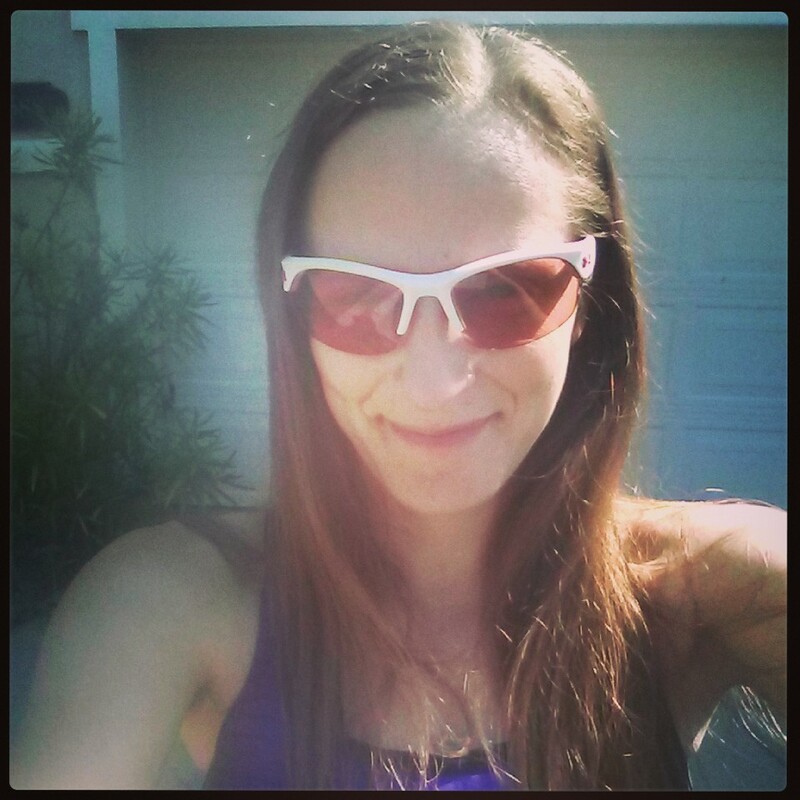 The Marbellas are the first sports sunglasses that I’ve ever owned, and I really like having a pair of sunglasses just for running (versus wearing my everyday glasses for everything). I love the Marbellas! They’re comfortable and so lightweight that I barely feel them on my face. They have an adjustable nosepad, which helps make sure that they don’t slip, bounce, or move when I’m running. My favorite thing about my Marbellas is the crimson lenses. They block the sun without being too dark, and they make everything the loveliest shade of pink! I truly love them. I do have mixed feelings about the white frames, though. I like that they’re different, but I don’t 100% love the way they look on me. I think my ideal combo would be a darker frame with the crimson lenses. 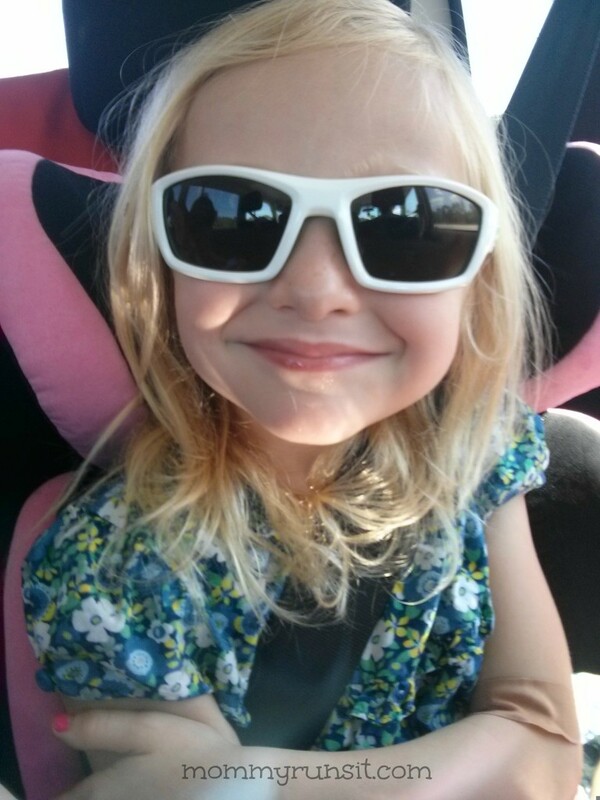 I think the Hobie Polarized sunglasses are the biggest hit with our family. My husband loves them and wears them regularly, both at work and recreationally. They’re comfortable, and they block the sun just like they’re supposed to. They’re even available with prescription lenses, which would be even better for him, since he wears eyeglasses much more frequently than contact lenses. 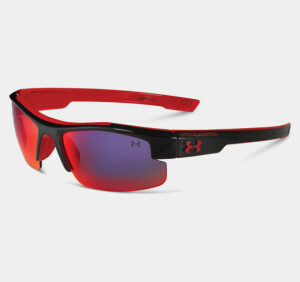 To see the full collection of Under Armour sunglasses, check them out online, and follow Under Armour on Facebook and Twitter. 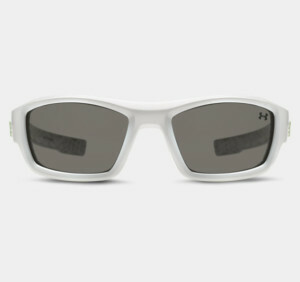 To learn more about Hobie Polarized sunglasses, visit them online, and follow them on Facebook and Twitter. 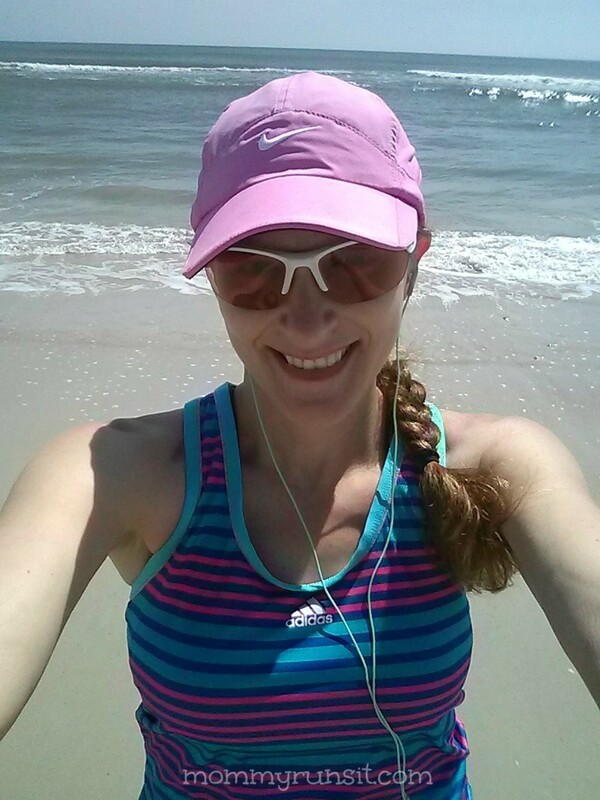 Do you wear athletic sunglasses, or do you wear your everyday sunglasses when you run, bike, or play sports? Big thanks to Under Armour & Hobie Polarized for letting my family check out your awesome sunglasses!!! I’m not really sure why, but I only wear sunglasses when I’m driving. Maybe because there’s no room for them in my purse? I did wear them on my recent trip to Disney World though. I think those sunglasses look cute on you!